Do yourself a favor and find a picture of Bartolo Colon on April 4, 1997, the day of his Major League debut with the Cleveland Indians. You will not believe it. Look at how svelte he looked, the picture of youthful exuberance and athleticism, just 24 years old. Now find a picture of Colon taken last night in Arlington, Texas, the day he won his 246th career game to become the winningest Latin American pitcher in Major League history. Look at how utterly human he looks, a big belly and double chin, the picture of someone completely comfortable with who he is, now 45 years old. After trying since June 30 to separate himself from Dennis Martinez, with whom he was tied, Colon pitched the first seven innings of an 11-4 win over Seattle and placed himself into the history books. Behind both of them now is the great Juan Marichal (243). “It was a long journey, but it finally came and it feels good,” said Colon after the game. Once one of the most prized prospects in the Majors, Colon has morphed into the game’s mascot, soft and cuddly. He’s always smiling, joking around, still tossing the ball in and out of his hand on the mound and throwing his best pitch, a cutting fastball, over the plate with great regularity. While in Oakland in 2012, he once threw 38 straight strikes. In his 560 career games, in 3,445.2 innings and against 14,557 hitters, he is 246-186 with a 4.09 ERA. He has played for the Indians (1997-2002), Expos (2002), White Sox (2003, 2009), Angels (2004-07), Red Sox (2008), Yankees (2011), Athletics (2012-13), Mets (2014-16), Braves (2017) and Twins (2017) before signing a Minor League deal with the Rangers this winter. He is a four-time All-Star and the 2005 Cy Young winner who has won at least one game in each uniform he’s worn. 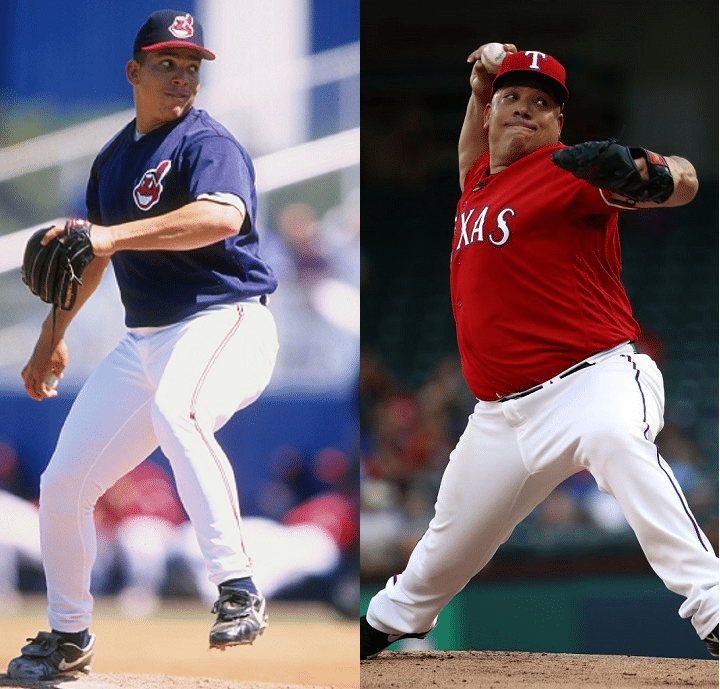 After the 2005 season, Colon had trouble staying healthy, making less than 50 starts over the next five seasons with a 5.18 ERA. 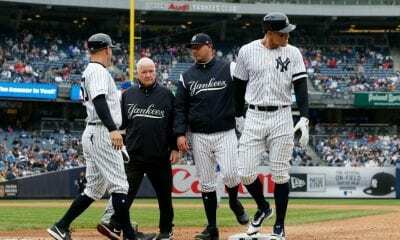 But he was not done, beginning when he resurfaced with the Yankees in 2011. With the Mets in 2015, he became the first pitcher in the last 80 years, aged 40 and over, the win his first four starts. After leaving the Mets, he struggled mightily last season, his ERA bloating to 6.48. But he managed to hold on again, just like he’s always done, because teams figure he still has enough in his tank (and quite the tank it is) to be a solid fourth or fifth starter. Still, Colon’s weight has proven to be somewhat of a problem with his employers. 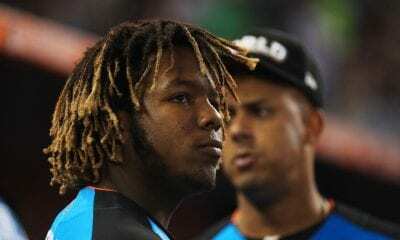 Two years after his debut, the Indians gave him a four-year extension with an added enticement: Colon would get an extra $12,500 each time he tipped the scales at 225 or less during quarterly weigh-ins. But perhaps the highlight of his long career came in 2016 with the Mets in San Diego. By then 42, he was considered one of the worst hitting pitchers in the game’s history. In fact, he still is. Colon has only 25 hits (and 166 strikeouts) in 299 at-bats, an average of .084. On June 18, 2014 against the Cardinals, Colon got his first hit in six seasons against Lance Lynn. But in his 226th career at-bat, Colon hit his first Major League homerun off Padres righthander James Shields. With that, he became the oldest player in MLB history to hit his first career homer. According to the New York Post, these were some of the reactions from his teammates that day. 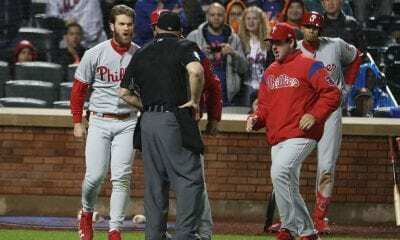 “A moment I don’t think any of us will ever forget,” said Kevin Plawecki. “They say anything can happen in a game, well …” said Asdrubal Cabrera. “This is one of the great moments in the history of baseball,” said SNY play-by-play man Gary Cohen. And when you think about it, so was Wednesday.